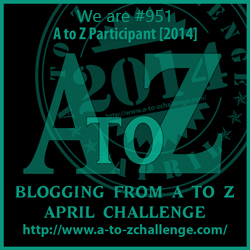 Thank you for joining us on our first ever A to Z Challenge! We had so much fun we will be doing it again next year! We are also joining Wordless Wednesday hosted by Blogpaws!! Have a great week! You all did a great job on your A to Z…Next year I think I’ll join the fun!! At least the spectators were probably amused? Very funny stuff 🙂 Kitties get the zoomies too. The difference is that they do it at 3 AM and while singing the song of their people. We did Zoomies today too for our final post – Congrats on making it to the end! My guys often have the zoomies just as we are starting an agility course! I think they get so excited that it takes a few moments to regain their self-control! Z is for zoomies! We love zoomies, too. Both our dogs and cats. Thanks for sharing the zoomies – it looks like loads of fun! I love it! I think it’s the funniest thing that happens on a course! !